The only software to recover failed Storage Spaces. Works with all Storage Spaces layouts - simple, mirror (regular and three-way), parity, and double-parity. Works with fixed and thinly provisioned spaces. Works with Windows 8, Windows Server 2012, and Windows Server 2016 Storage Spaces pools. Significantly damaged metadata, inconsistent pool or drive configuration. Deleted pools or completely destroyed metadata. Formatted spaces and deleted files. All of us get used to ignore system requirements when installing software thinking that all tools are designed to run on a regular PC. However, Storage Spaces recovery is not an ordinary task to solve which you need large amounts of resources. So we strongly recommend you learn carefully the minimum system requirements for a PC on which you are going to recover Storage Spaces. Otherwise, you risk wasting a lot of time and getting no result. Memory: 2GB and additionally 0.5GB per drive. Note that it is the absolute minimum memory requirements; generally, the more memory the better. CPU: a core for every two drives. Note that CPU requirements are less critical than memory requirements because in the worst case the software will just work proportionally longer. Disk space to store temporary files: minimum of 4GB per drive of free space is required. Our eBook is a must for everyone who plans to recover their failed Storage Spaces at home. It covers all the significant aspects of Storage Spaces recovery. When regular file recovery is enough? "Drive or storage space issues; check the Physical drives and Storage spaces sections". Storage spaces is "inaccessible; reconnect drives". Some of the drives contain an "unrecognized configuration; reset drive"; don't do it if you plan Storage Spaces recovery. 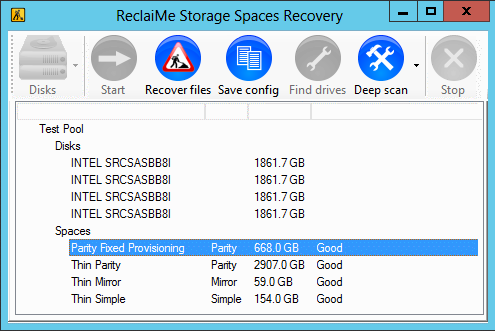 ReclaiMe Storage Spaces Recovery can handle most of the common Storage Spaces errors.